In going through some old clothes, I recently found my sashes and neckerchiefs from my Boy Scout days. I was in Varnell's Troop 67 from the time I graduated from Webelos to the middle of high school. I made Eagle when I was 14, about as fast as was possible, mostly through the constant prodding and help of my dad. My Eagle project was renovating a room at the old Varnell school to be the town's first library; the group cleaned out the room, redid the floor, put up shelves, and got the initial collection of donated books together. 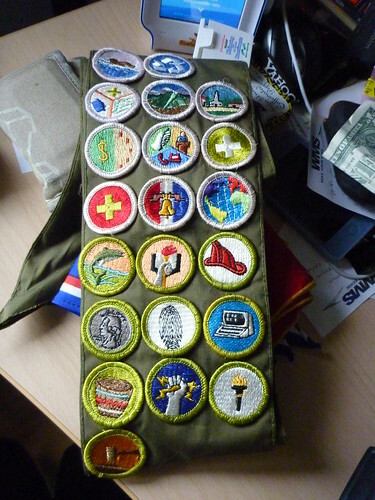 One of the sashes was my merit badge sash. To earn the various ranks in Scouting, you have to fulfill some rank-dependent requirements, but you also have to earn a certain number of merit badges. Some ranks have specific badges you need, while others are based on your own interests. I remember getting a lot of the Eagle-required badges while at Camp Sidney Dew the one summer I went to Scout camp. That's where most of the requirements for Basketry, Camping, Swimming, and Safety were done. Fishing was something my dad loved to do, so it was a natural. I also had a coin collection with him, so getting that badge was easy. I think we had a detective come to the troop and lead a fingerprinting workshop and the same thing with a local fireman. The public health badge was probably due to my aunt Kaye who worked as a blood technician, and public speaking was associated with my work on the debate team in high school. In looking back on this list, I'm actually quite surprised how relevant a lot of this was. I don't really like camping that much, but I apparently did a bit of it then. I recently found a stash of electronics part I had when I was in high school; I didn't do much with them then, but the books I picked up are proving useful now that I'm actually building gadgets and PC boards. Scouting was a big influence on my life, and even though it has had it's share of issues over the years, I hope one day I'll be able to be active in it again with my own kids. Hey - I love that you found your sash, and that you shared! My oldest is a scout now and it's a bit weird being on the 'grown-up' end of things, hehe.